Why is my model out of view when I load a camera motion? Is it OK to adjust downloaded motions? How can I adjust a motion to fit my model? Why do my model’s arms go through the body? “Clipping” where hands or whole arms pass through the body. Camera motions designed for models taller or shorter than yours. It’s really annoying to see these issues in videos. Not only does it just ruin the viewing experience, but it’s an easy fix if you’re willing to put a bit more effort into videos. Is it OK to adjust downloaded motions? Many times a motion will say not to change it or not to use parts of it… but the creator wants you to be able to use the motion: that’s why he or she put it up for download… so it’s OK to make the tweaks necessary to fit your models and your stage. … just don’t redistribute that motion file and claim it as your own… always credit the original creator of that motion file. In this tutorial, I’m going to show you how to fix these minor issues, as well as a few tricks to make it easier/faster for you. If your model’s limbs are clipping into the body in a way that shouldn’t be possible, as shown in the first picture, then the easiest way is to go through the entire motion, find the parts where the model clips, and simply move it out of the way. The reason clipping happens is because each model has a slightly different skeletal structure. 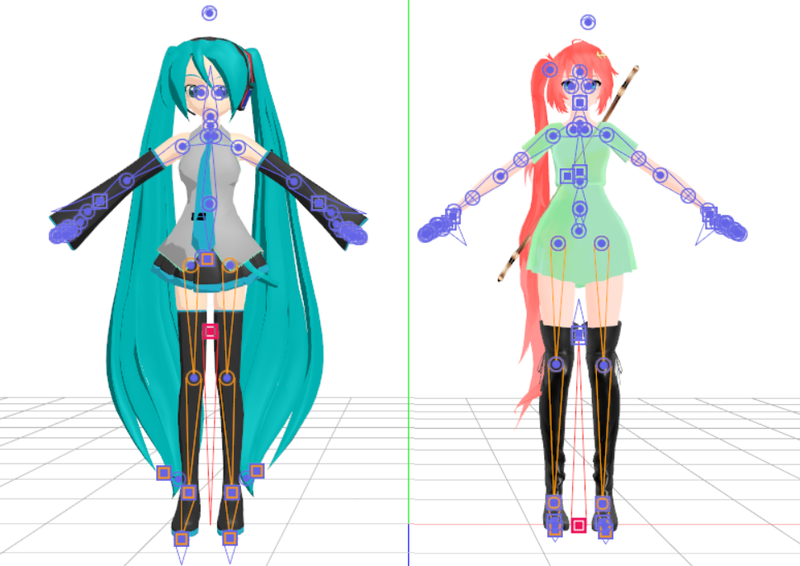 Take an Animasa Miku for example, and compare it to the model I used. You can see that the way the bones are placed is different in each model. Some models might also have different proportions. They might have longer arms, shorter body, or a larger bust. 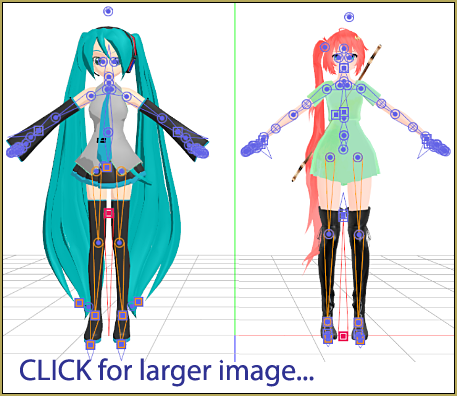 MMD motions are calculated by the angle or distance the bone is set to move by the original creator. Since each model has different anatomies, clippings are expected to happen! A model’s arm might be too long compared to the original, and as a result, it may move too much. 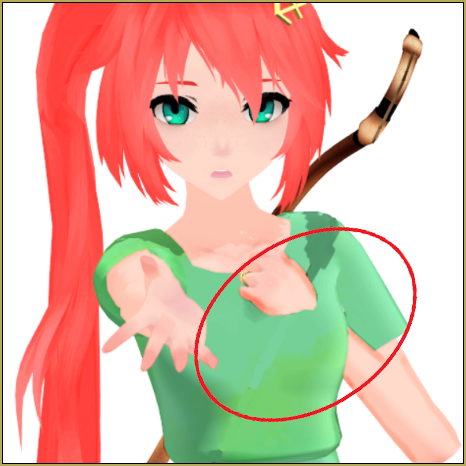 In this image, I found the elbow keyframes where the hand goes through the model’s chest, adjusted it, and registered it on the keyframe. It is extremely important to register it ON A KEYFRAME. Otherwise, the arm will just pop right back into place, since the problem keyframe still registers to the same place. Use your keyboard’s Left-Right arrow buttons to move through the motion as a way to see that you have actually fixed the problem. These are ‘next keyframe/previous keyframe’ buttons, they allow you to skip immediately to the next keyframe of the bone/bones highlighted in red. Here, I have the motherbone highlighted. 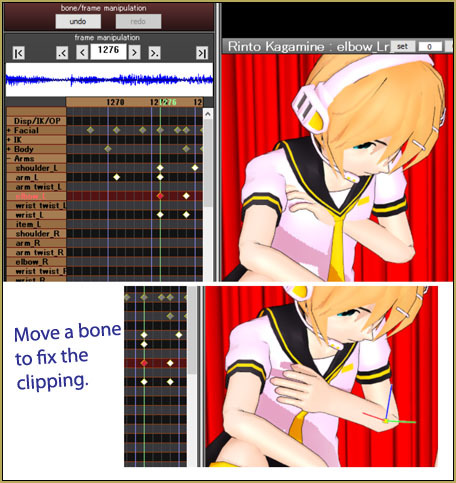 If I were to press the button the arrow is pointed at, MMD would immediately take me to the next frame where the motherbone is registered. 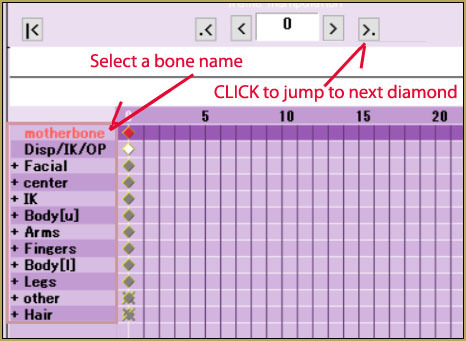 You could also highlight a bone category, which are the ones with a + to the left of them. Pressing the arrow on those will take you to the next frame where a bone that belongs in the category is registered. For example, if I highlight ‘arms’, it would take me to the next frame where a shoulder, arm, elbow, or wrist is registered. This is shown in the second image above, where the model is way too tall for the camera to capture. This error appears for the same reason as the model clipping issue: the camera bone needs adjustment. So, without further ado, let’s get right into fixing it. Now, of course you can go to every camera keyframe and move it a bit up or down, but you’re probably exhausted from fixing the model motion. There is a much simpler way to fix camera motions. 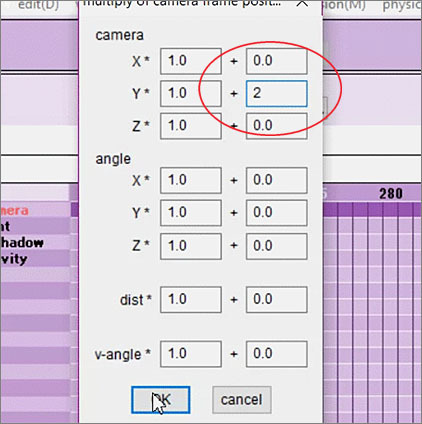 This adjustment will move all of the selected camera frames up, down, left, right, forward, backward… even tilt it, according to the number you put in the second boxes. In the image, I changed the value in the second box of camera Y to 2, pressed OK, and you’ll see that all of the camera frames are moved up! You don’t have to painstakingly move every camera frame individually! You will probably need to Control-Z to UnDo and then retry things a few times to find exactly the right setting for your scene. Adjust the motions until your animation looks great! Remember, before rendering a video and uploading it, make sure you check the motion all the way through to make sure there aren’t any bugs! Move bones on certain keyframes to avoid clipping, and use “multiply of camera frame position-angle” to fix a camera motion quickly!